We are still several months away before the QOOQ (pronounced "cook") drops on colonial shores, but we are nonetheless excited at the prospects that this presents. Not that we're looking forward to again dropping money on another tablet to clutter our kitchen island, as our iPad is serving us just fine, but this is far more to the home chef than the iPad is. That being said, it is not at all aiming to replace it. First, the obvious glaring difference with the QOOQ as opposed to your existing tablet is how beefy it is. The QOOQ had the messy chef in mind when it was designed as the device is surrounded by a splash proof screen and casing, and durable rubber feet to ensure it stays gripped to your counter top. Where it detours from the normal tablet is the contents. 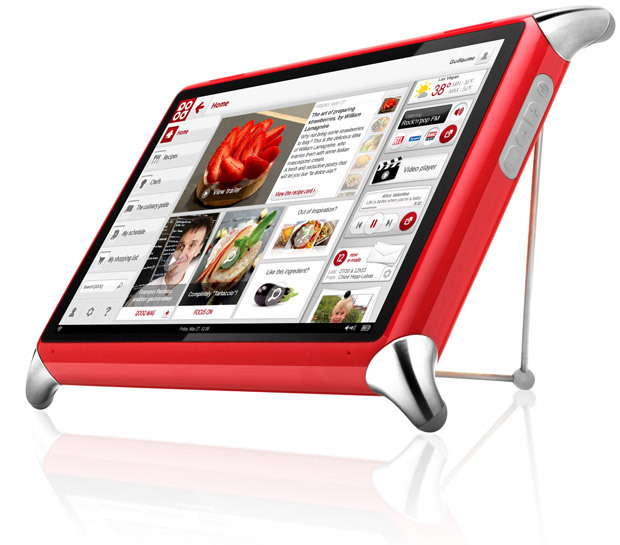 The QOOQ contains 3600 recipes that are available 50 at a time with a monthly subscription. At first glance, this would appear to seem like a bait and switch, but by releasing them 50 at a time you can spend a month cooking what's offered to you....this way you won't be overwhelmed by the shear volume of it all. In conjunction with these recipes there are over 1200 demonstration videos by professional chefs for those of us that prefer a more visual instruction. There is a recipe calculator that allows you to modify recipes based on the number of people being served, and a grocery list generator so you can quickly determine what and how much you need to buy. Our personal favourite feature is the weekly meal planner that works with the afore mentioned grocery list generator, so that there is no more wandering the aisles wondering what to make and thereby giving in to the devil on our shoulder that convinces us that potato chips and ice cream fulfills our vegetable and dairy requirements for the day. You are however going to have to wait for an english one to arrive in the Americas, but if you can work with French, the white one is currently available here.